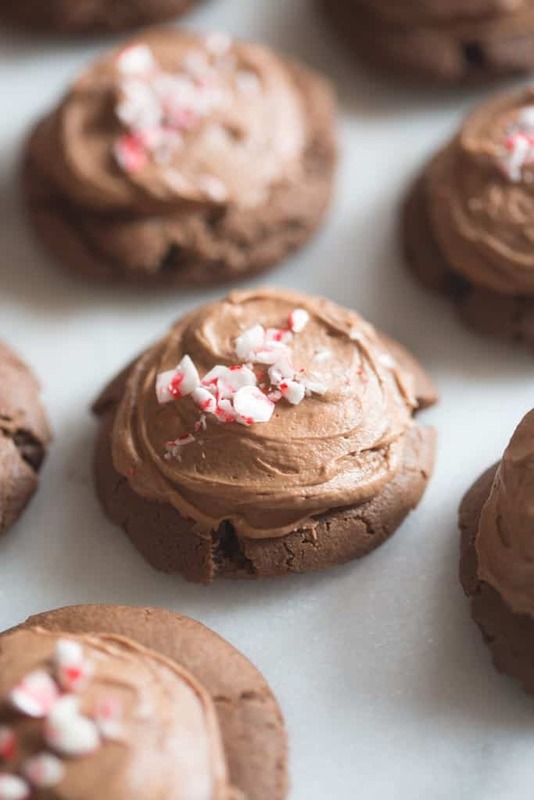 Chocolate Marshmallow Cookies are one of my favorite holiday cookies! 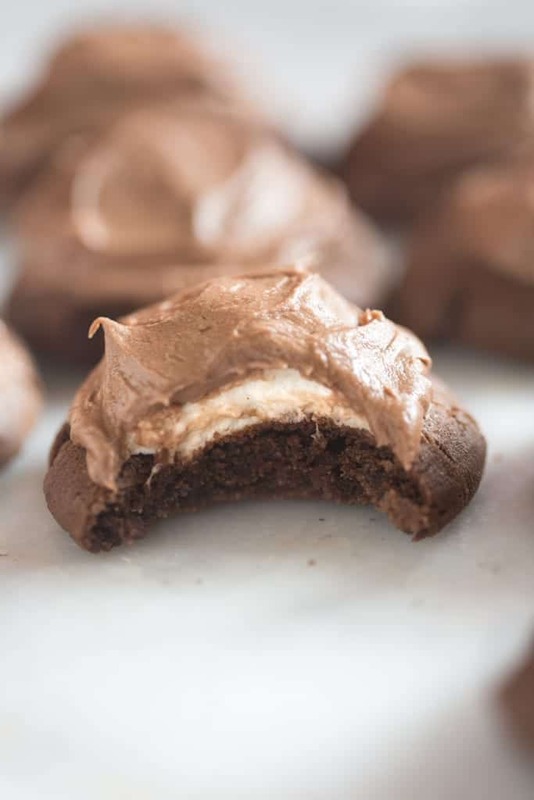 Start with a delicious chewy chocolate cookie, topped with a warm marshmallow and smooth chocolate frosting. My mom has been in town the last week playing sous chef for me –helping me cook up dozens of new recipes to share with you guys. I couldn’t wait to share these Chocolate Marshmallow Cookies. This is a recipe my great aunt used to make, and they’re delicious! The chocolate cookie itself is absolutely delicious. It’s thick and chewy with a little bit of crunch on the outside but soft and chewy on the inside. 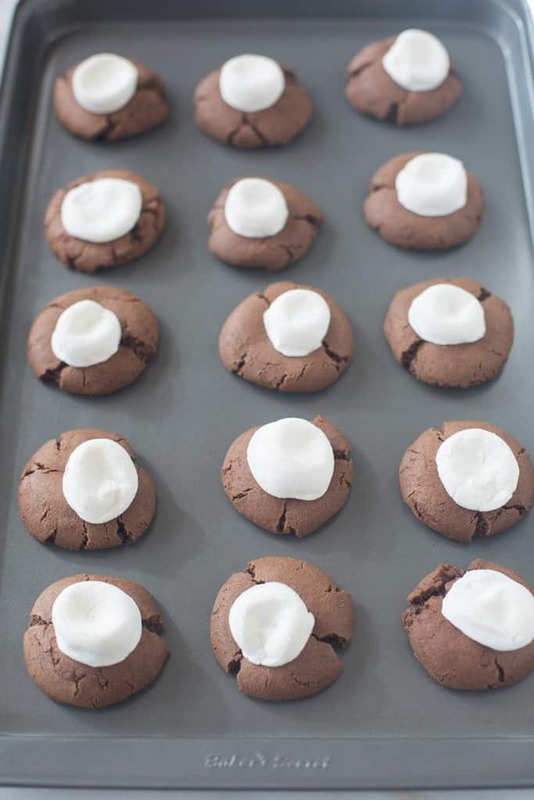 Once the cookies are baked you put a marshmallow on top and stick them back in the oven for a minute or two to soften the marshmallows. 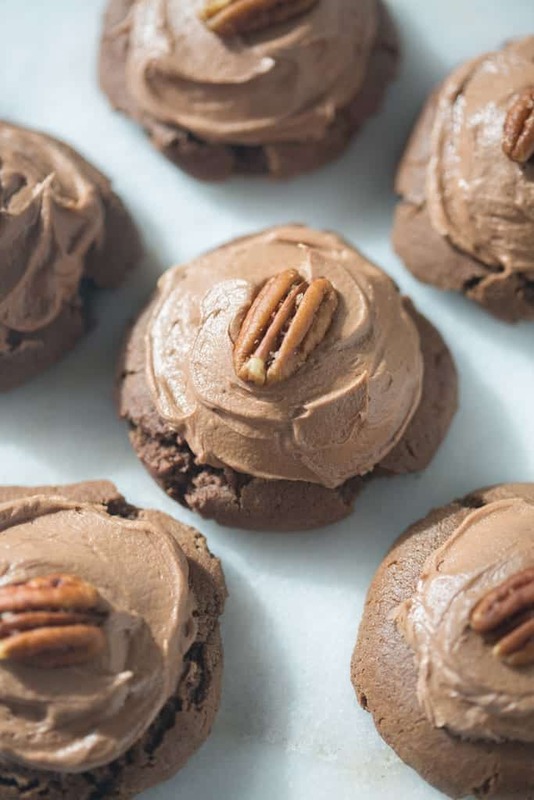 Once the cookies are cooled you top them with a delicious chocolate frosting. 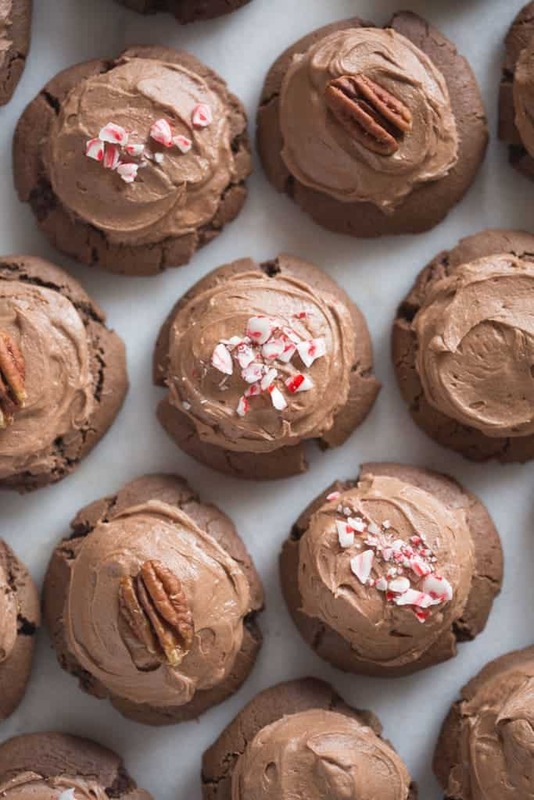 You can leave them that way or even add some crushed peppermint candy or a nut on top. My great-aunt always added walnuts, but I like to use pecans. 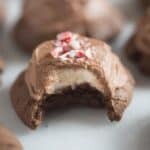 I love serving these Chocolate Marshmallow Cookies to people who have never tried them before. They bite into them and are always pleasantly surprised to find the marshmallow center. There’s never been a time I’ve served these that I wasn’t asked for the recipe. It’s a keeper, and perfect for the holidays! 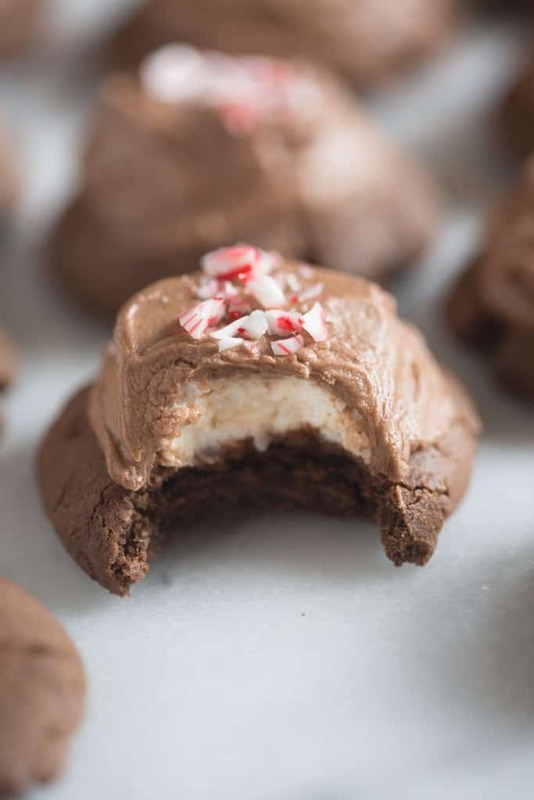 Chocolate Marshmallow Cookies have a delicious chewy cookie, topped with a warm marshmallow and smooth chocolate frosting. Add the butter and sugar to a mixing bowl and cream together until light and fluffy, about 3 minutes. Add eggs and vanilla and mix well. In a separate bowl, combine the flour, cocoa powder, baking soda, and salt. Add to the bowl with the creamed butter mixture and stir just until combined. Scoop the dough by rounded tablespoons onto your cookie sheet. Bake for 8 minutes. Remove from oven and top with a marshmallow half (cut-size down). Return to oven for 2 minutes. Allow to cool completely while you make the frosting. Add butter to a mixing bowl and beat with electric mixers for 1 minute. Add the cocoa powder and milk and mix to combine. Add powdered sugar and mix for at least 2-3 minutes or until smooth. Mix in vanilla. Add more powdered sugar if needed. Once cookies have cooled, cover the tops of the marshmallows with frosting. Made these today for a cookie exchange. They are beautiful and DELICIOUS! Thanks so much for the idea and recipe. Your mother was telling me about these when we talked today. I may have to make them this year!! But I am FOR SURE making your Mint Chocolate Brownies for a wedding lunch tomorrow. It is the best Choc Mint Brownie recipe I have ever found!!! Thanks so much Ciel, you are so nice! I’m so happy you love the mint brownies! And I hope you get a chance to try these cookies! I do not know if you realize it but you never wrote down the amount of salt for the recipe. I am guessing it would be 1/4 teaspoon. Could you please tell me if that is correct ?? Hi Sandy, thanks for pointing that out! I updated the recipe to and I use 1/2 teaspoon of salt! I would love to know how they turned out for you! did you leave the salt out of the recipe? Just wondering how much salt? Hi Roylene, if you are using unsalted butter, you can add a pinch of salt! Yes, they freeze well 🙂 Enjoy!